Fireplaces are great, grand features to a home that create a focal point to a room, acting like a center piece to show class and elegance. There is no real limit to what we can do with them, even those which have long since been used as a place for a fire, however they do give us a space to decorate and draw attention to. Fireplaces are the idea area for seasonal decoration, particularly a working fireplace. They are iconic for Christmas stockings and pinned up holly during the Christmas season and are perfect for draping fake cobwebs and hanging bats during Halloween. 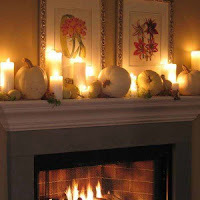 Yet not all homes appreciate the everyday decoration for a fireplace. People’s eyes are instinctively drawn to the fireplace, which is why so many people cover it in photo frames and leave it looking cluttered, but one photo frame with a small vase of flowers either side is a more tasteful and appealing look for your fireplace. Leaving the mantel bare, or almost bare with perhaps a small ornament near the middle, and hanging pictures above it can create a cozy atmosphere, particularly on a wall painted with cold colors if the other walls in the room feature warmer colors. This is particularly effective for working fireplaces. In some cases sticking to a symmetrical design can be ideal, generally with one item at the center such as a mirror or image (a decal on the wall can be a cost effective artwork if you want to draw in some attention). 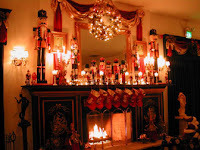 However in some cases symmetry looks dull or overdone, particularly if you have a little more decoration to your fireplace, in these cases having things that are slightly off symmetrical can be a great touch; for this place pairs of items on the mantel as you would with a symmetrical design, but they don’t have to be identical – just related to each other. Use bright colors on in a white space and light colors in a dark space. If your fireplace is white and your wall is white why not have a yellow pot or some flower design plates on show on your mantel? The color will draw in the eyes of your guest and add warmth to the room without taking away any of the light and without the dull look of black on white. Try to keep these all within the same color family for more impact. In a dark room try to use soft light shades, such as a pastel pink or blue to draw out more light in the room and create a contrast. If your taste is more modern than a traditional 16th century fireplace that’s being used to show off all your classical books then you might think about having something else as a focal point of the room. Modern rooms look great with sparing furniture, light colors and elegant designs; the homeliness of a fireplace rarely suits this. You might consider taking it out and replacing it with an ultra modern radiator, which depending on the style you select makes a great addition to a contemporary home appearance.